As a caregiver, the opportunity to serve someone so closely and intimately can bring depth to a relationship that is sweet and precious to both people involved. 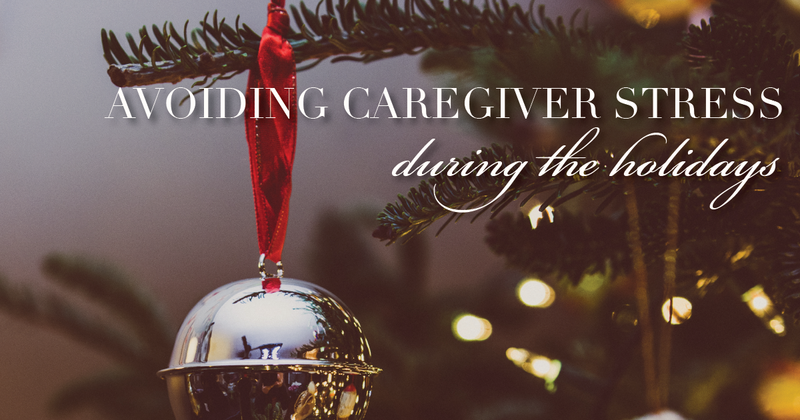 But, being a caregiver, especially during a busy holiday season, can also be extremely difficult, leading to excessive stress. Being aware of the signs of caregiver stress helps you protect your health. By keeping yourself healthy and well balanced, you ensure you're able to care for those who rely on you while still enjoying your time with friends and family. Read more about the effects and signs of stress here. The holiday season comes with lots of delicious treats, but many of them are higher in fat and sugar than your regular diet. Remember to eat a well- balanced diet in spite of holiday food everywhere in order to keep your energy up and your body functioning normally. Also, don't forget to keep drinking water! When it's colder out, and you're not craving a drink to cool off, it's easy to forget to keep your water intake high. Additionally, make it a point to get some movement in daily and do some more intense exercise a few times a week. Why proper nutrition and exercise? It's hard to help someone if you're not well yourself. If you're tired, sick, overrun, and stressed you'll be unable to love and care for those around you. Caring for your health also means doing things that restore your heart and mind: going on a date with your spouse, reading a book, going to church, or taking a couple of hours to yourself. When a caregiver is healthy, he or she is then more able to care for his or her loved one. One of the hardest aspects of being a caregiver is the feeling of having to do everything on your own. It is crucial for caregivers to ask for and accept help, even if it's temporary. With busy holiday schedules and travel, finding areas of your caregiving duties that can be covered by someone else for a short period can free up some much needed time. "Help" may involve temporarily paying for housecleaning, cooking, or laundry. Take inventory of all that you do and make a note of which tasks could be delegated to other friends, family, or professionals. Doing this will allow you to manage your commitments, keep up with caregiver duties, and make sure time has been carved out for those personal activities encouraged above. What ideas do you have for managing extra holiday stress and duties? We'd love to hear them.